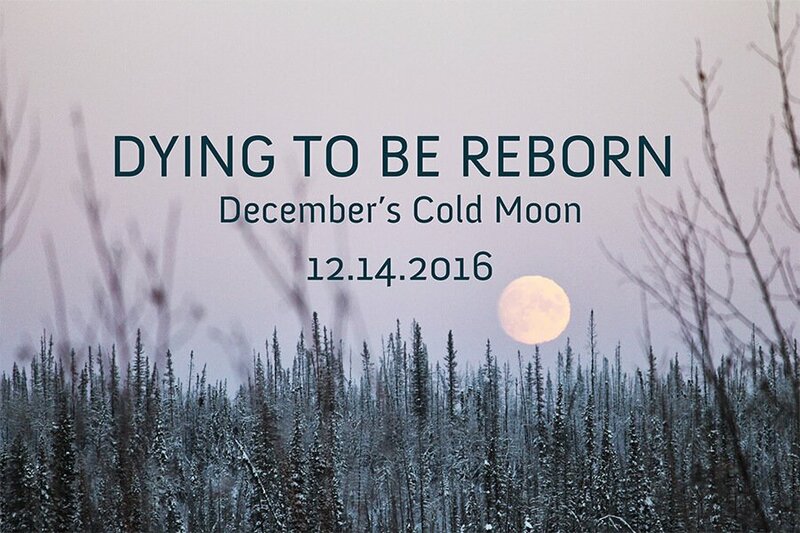 2016 is coming to a powerful close with December’s full cold moon on the 14th. As winter sets in around us, the silence of snow descends upon the ground, and the warmth retreats indoors to hibernate, now we are called to go within. Deep within ourselves, our desires, our fears, and our darkness. The December full moon is aptly named the Cold Moon, but was also referred to as the Long Nights Moon by some Native American tribes as it is leading us towards Winter Solstice, the longest night of the year. While the nights lengthen and frost covers the earth, we receive a reminder to explore our own fertile grounds that lie buried underneath. This is the time to tap into the gifts of our darkness that are waiting for the loving light of acknowledgment. You may experience this energy as a desire to make a change in your life, whether it be subtle or significant. This is the voice of the Divine Feminine, calling us forth to flourish into our truest selves. Whether it is a baby you long for, a new love, or a change in career path, a part of you must first be reborn before you can bring forth new beginnings. It often takes great courage to dive deeper into the heart’s true yearnings, yet this is where the treasures of self-knowing lie. It is the Divine Feminine within us that is waiting to be unearthed. Perhaps there is a stirring in your body and soul that can provide you with a roadmap for making 2017 your most attuned year yet. Meditating on this will help complete the cycle of blessings received in 2016, whether they have been challenging, joyful, or both. Maybe you took a leap into fertility support via IVF, IUI, FET or fertility coaching and maybe you faced the challenge of not getting pregnant. And yet you took a step forward towards your dream of motherhood, a step worthy of celebration. Let the darkness of this first winter month provide you with a canvas to explore your own inner light as we approach the New Year. Ancient tradition regards the full moon as a particularly powerful time for meditation, energy practice, and inner work. Thankfully for us, the full moon energy spans three days before the 14th and three days after, so we have plenty of time to take advantage of this potent energy. I would love to guide you…. Which is why on the evening of the 14th I’m hosting a Full Moon Facebook Live Meditation event. Join us! We will come together virtually in circle to share in the collective energy of this December full cold moon.